Real time facial motion capture with Kinect and Webcam. 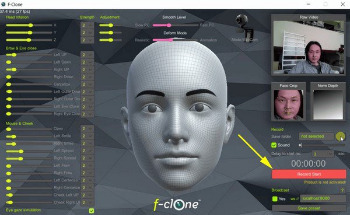 F-Clone is the world’s first software that uses cutting-edge technology to record facial expressions and movements in realtime/3D with just a Kinect or a webcam. Add emotions to your character. With this software, users can create not just games but personal avatars, such as a virtual character to be the presenter in a YouTube video. This means the software can be applied to personal creation and indie animation as well. f-clone is able to export motion data that is fully compatible with Autodesk MAYA, MotionBuilder, Blender and the DAZ Studio, it is widely usable by the many companies, individuals and hobby users. f-clone has uniquely redesigned the library it uses to planarly match facial characteristics to images of faces, and has brought together technology in increased speed, 3D transformation, the removal of noise data, smoothing, and simulation of facial muscle movement to bring about real-time markerless facial motion capture with just a webcamera. Record 3DCG video in real time with 21 pre-installed character and 17 background videos for youtube or your original animation. You can record facial motion and sound in real time by any webcam you have. No marker required. Direct recording 3dcg video with pre installed 15 character models and 17 background videos. Transmit the facial motion data in real time with websocket. You can broad cast facial data through internet. Switch between real mode and animation mode to create motions suited to your character. fbx, csv, and pz2(compatible with DAZ3D) export for motion. You can read it your 3D software. Use f-clone’s websocket broadcasting function to animate your model in real time. You can read optical face motion data through MotionBuilder and attach to your character model easily. You can adapt the motion capture data to thousands of DAZ character models by importing pz2 data. Animate your Blender character model with f-clone Blender pipeline. Animate your character model with f-clone Autodesk MAYA pipeline. f-clone’s motion capture is smooth and high quality. You can use it immediately in your product level movie. – Add direct video record mode with 21 characters. – Face capture accuracy increase. – Application window size resizable now.